The Bulletin piece also include a section on 'A Day In The Life' of a HSRC Fellow from Dr Tom Poulton of the National Emergency Laparotomy Audit (NELA). As well as supporting HSRC projects, the fellowship programme aims to support the development of tomorrow's academic leaders. 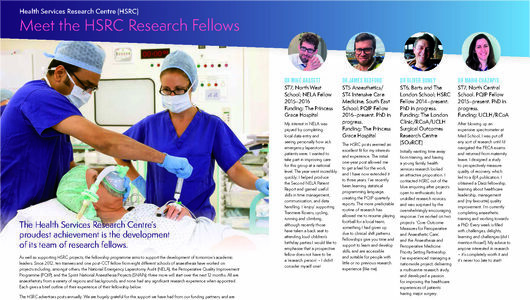 Since 2012, ten trainees and one post-CCT fellow from eight different schools of anaesthesia have worked on projects. These projects include, as well as NELA, the Perioperative Quality Improvement Programme (PQIP), and the Sprint National Anaesthesia Projects (SNAPs). Three more Fellows will start over the next 12 months. All are anaesthetists, from a variety of regions and backgrounds, and none had any significant research experience when appointed. The HSRC advertises posts annually. We are hugely grateful for the support we have had from our funding partners and are always looking for opportunities to work with research funders and hospitals across the UK. 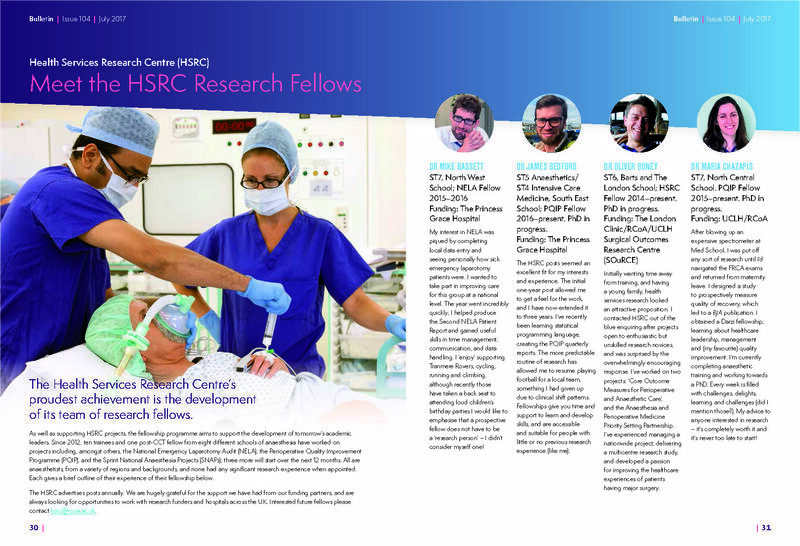 Interested future fellows please contact the HSRC.